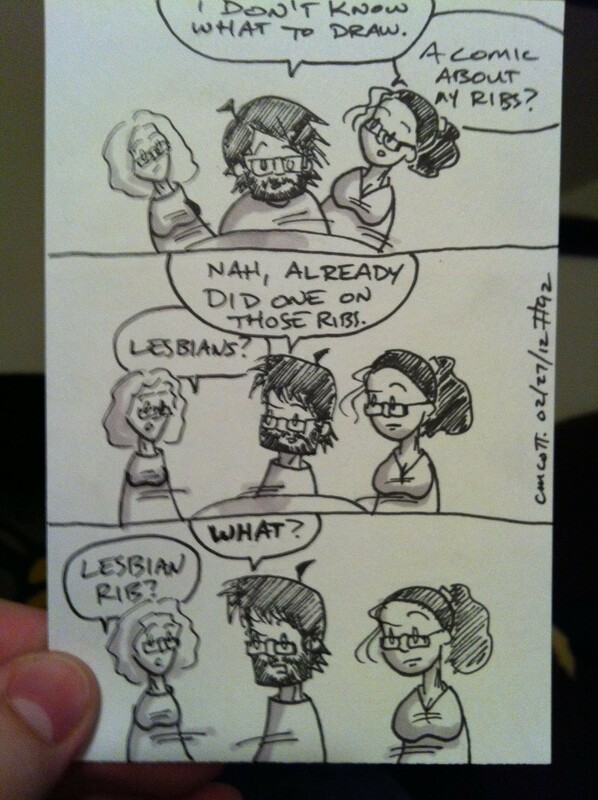 Yet another comic based on real-life things I actually hear in my house. 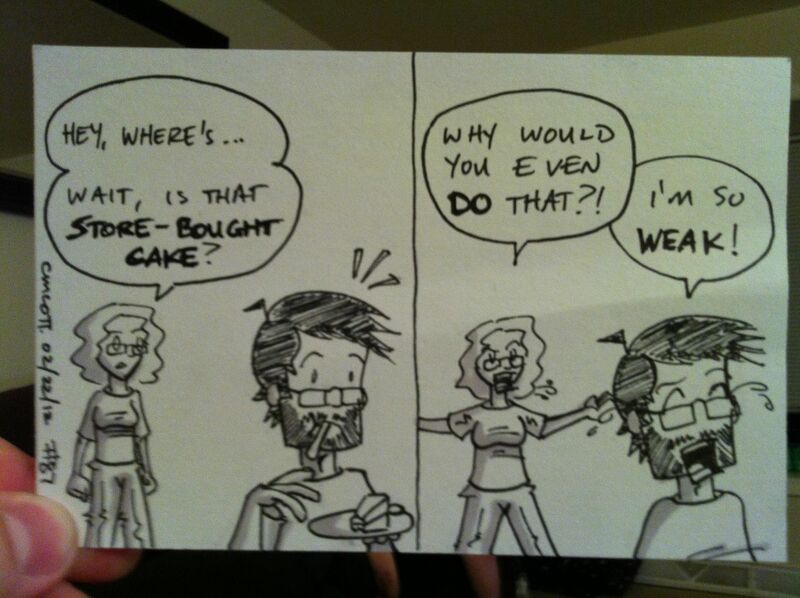 I’m tempted to just follow my sister-in-law around and make the comic about her everyday life. It’d be hysterical. Today, I had to explain to my wife and sisters-in-law who Rob Liefeld was. It…wasn’t pretty. Seriously, anyone who read comics back in the ’90s already knows everything I’m about to say, but for the uninitiated: Rob Liefeld is a comic book “artist” who cannot draw. His grasp of anatomy and perspective were…woefully inadequate, to say the least. Back during the 1990s, you couldn’t open a Marvel book without seeming his artwork, and now…despite the fact that it’s twenty years later and the comic book speculation that his own work helped fuel has burst in a way that’s painful to even talk about…despite all this, he is writing drawing and writing a book (and writing two others) for DC. It just…doesn’t make any sense. 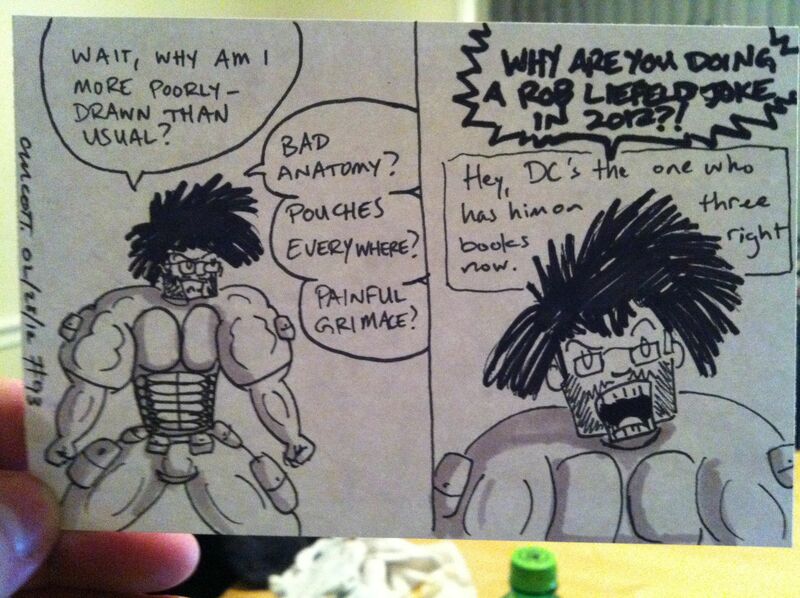 So yeah, a Liefeld joke. 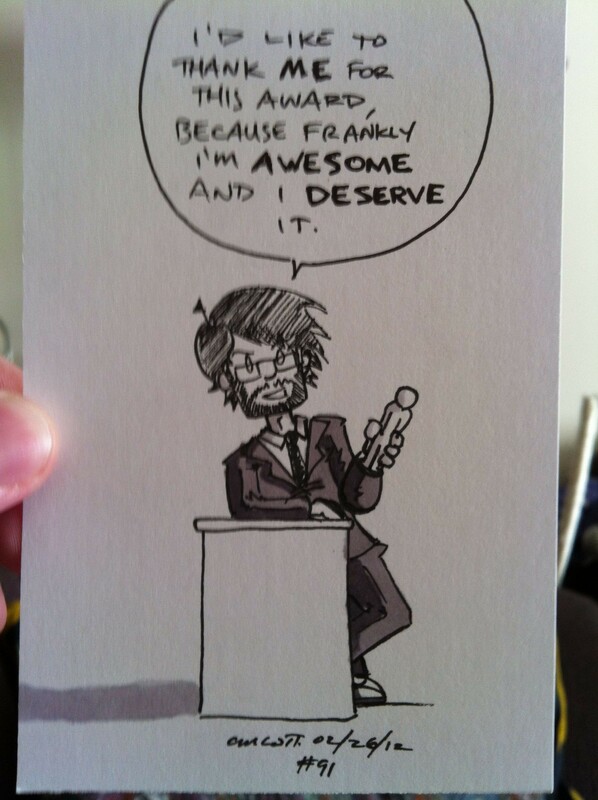 Because it’s still timely and appropriate in the year 2012, apparently. 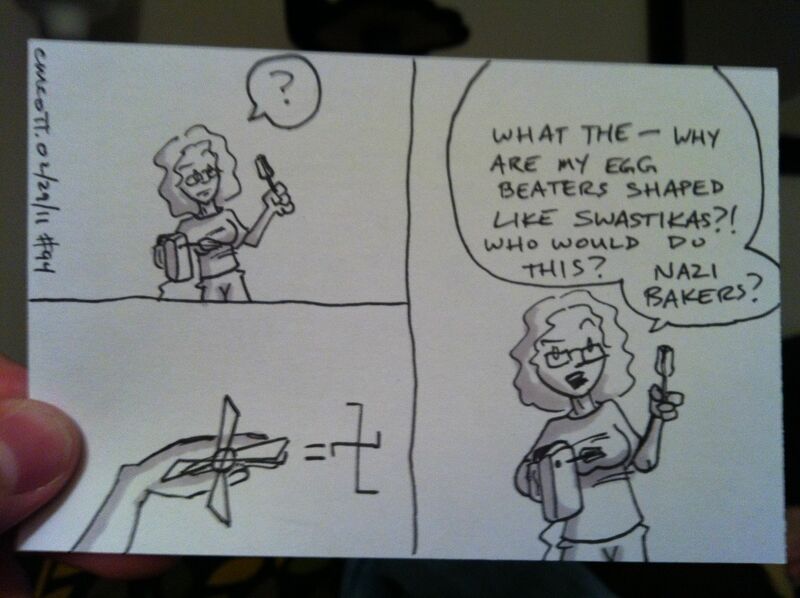 Some comics come straight from life, unedited. This is one of them. So I guess the Oscars are tonight? I dunno, I won’t be watching. However! However, I was nominated for something called a Versatile Bloggers’ Award by Tippeh, which I thought was quite lovely even though I’m not really at all sure how it’s supposed to work or if I have to make a speech or something. I certainly hope there’s no getting dressed up involved. 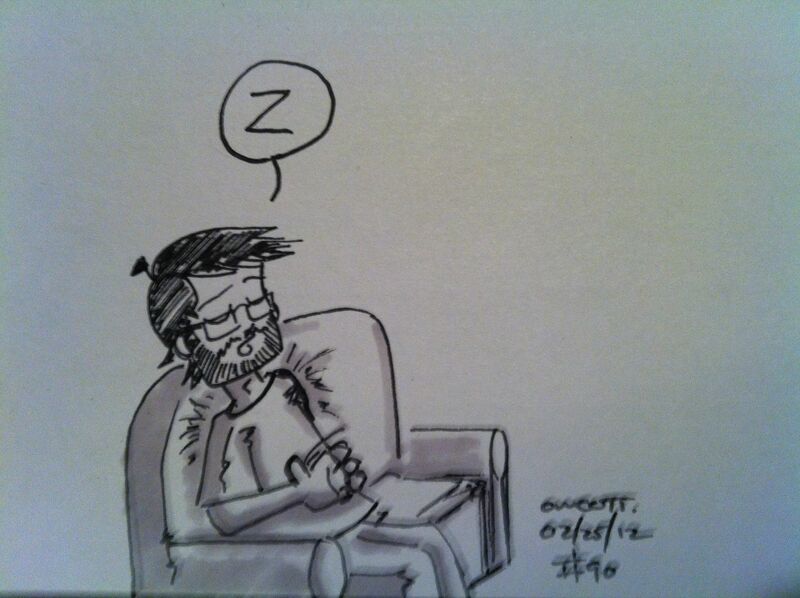 Today, for the first time since I started taking Adderall a couple of weeks ago, I took a nap. It was a short one, but it felt glorious. Now, if you’ll excuse me, I’m tired and need to go lie down. 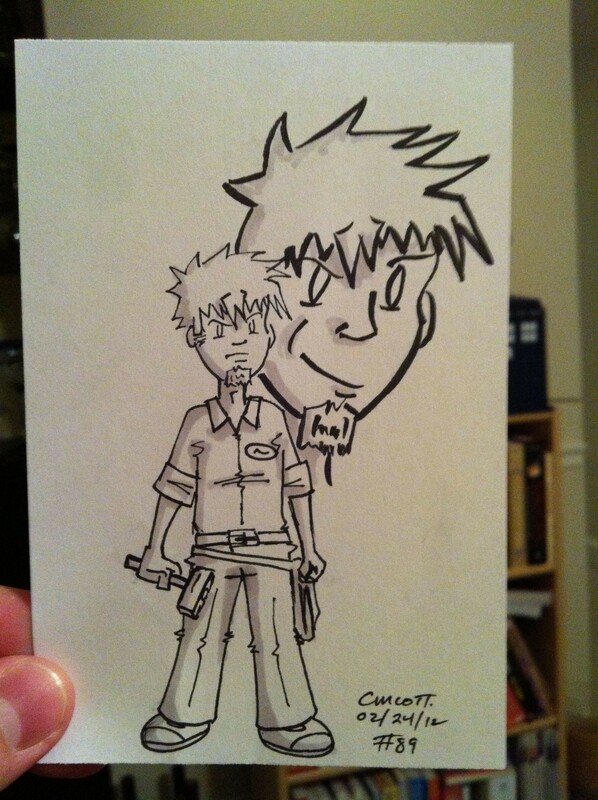 Several years back, my friend Chad kicked a webcomic idea my way about a guy (I can’t recall the character’s name now, sadly) who was a reality repairman. I loved the idea, and I did a few initial character sketches, but nothing ended up coming of the project because (1) I couldn’t manage my time and (2) I was actually busy as hell working full-time, just getting into my relationship with the woman who would become my wife, and taking graduate classes to earn my teaching license. And I was still doing Crooked Halo, so I had a pretty full plate. So this sketch is based (loosely) on what I recall of the original character design. I still love the idea of him having kind of a frat-bro look about him, with the casual-looking-but-it-actually-took-effort hair and the douchey goatee thing. Also, I had this idea that he’d probably solve most of his problems with a hammer. What? It’s not any less-probable than the Doctor fixing everything with that screwdriver of his, sonic or otherwise. 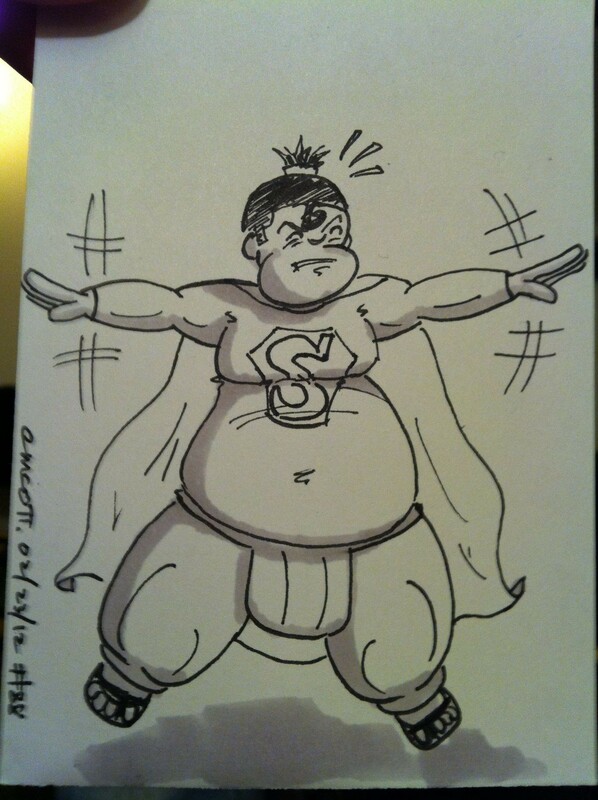 Today on Twitter, Nate Cosby (former Marvel Comics editor and the writer of such comics as Image’s Pigs, which is kinda awesome) challenged folks to draw a Sumo Superman. Here’s mine. This has not happened. God willing and the creek don’t rise (as they used to say), it will never have to happen. I think this means my sister-in-law Allison has to keep me in cakes indefinitely. 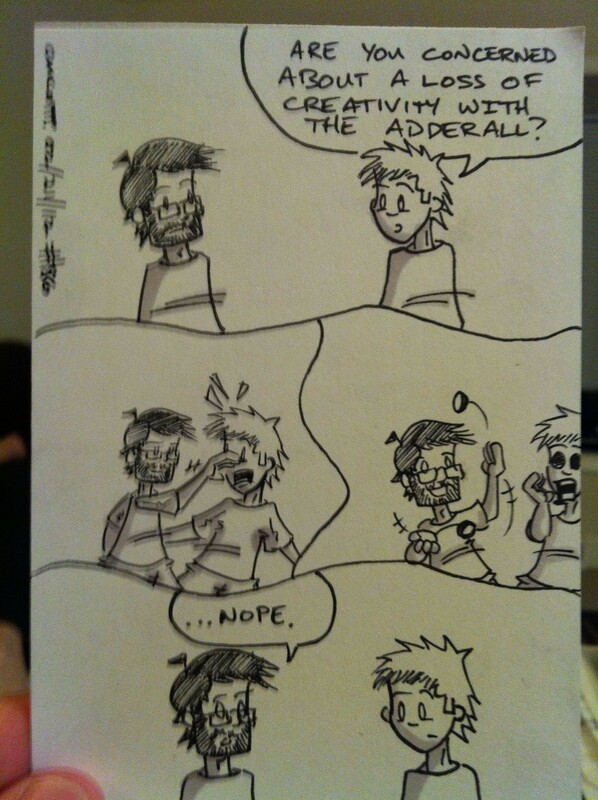 One of the possible side effects of Adderall is, apparently, loss of creativity. It’s not a problem I’ve really experienced, thankfully.